Buy online Maple Chocolate 12 mm Thick x 4.92 in. Wide x 47.76 in. 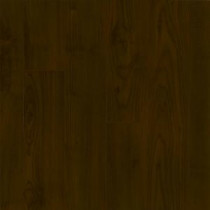 Length Laminate Flooring (13.09 sq. ft. / case) L304612E and leave review or share with Your friends. The look of rare wood species at a fraction of the price. Our laminates are designed with nature in mind and an eye toward the distinctive. Micro-bevel edges and ends accentuate each plank. 5 in. wide single plank visuals create true-to-life hardwood flooring pattern. Planks install faster and easier than other laminates with a simple two-step process Simply Lock and Fold. The locking installation requires no waiting time before moving appliances or furniture back on the floor. And furthermore, there's no messy glue residue or fumes. Bruce laminate floors are designed for your sense of style, with an appreciation for your lifestyle. Bruce floors are incredibly realistic and the technology beneath them is pretty incredible, too. Each floor combines beautiful design with durability - all at an affordable price with the industry's best warranties. So whether you choose the casual flair of a classic hardwood look, the sophistication of an exotic style or any of our other distinctive laminate floors, you can count on realistic looks, easy care and uncompromising quality. 13.09 sq. ft. per case. Case quantity: 8. Case weight: 29.48 lb.